From Monday till Thursday, the IOC Committee was in Tokyo evaluating the Tokyo 2020 Olympic Bid. Tokyo is going against Madrid, Spain and Istanbul, Turkey. The Tokyo Olympic bid is the second time in a row after failing to get the 2016 Olympics. The past Governor of Tokyo, Shintaro Ishihara had a grand plan to bring the Olympics to Tokyo. Mr. Ishihara went onto national politics and his successor picked up the torch. The bid itself looks good on paper but it might have already been doomed to failure. The 2018 Winter Olympics will be held in Korea and the chances of Japan making it past the first round is pretty slim but you never know. On the other hand, there is a lot of guaranteed infrastructure and Tokyo won’t have to do too much to improve itself in order to accommodate the circus known as the Olympics. The only wildcard in the bid was the stadium, but that has been settled with the 2019 Rugby World Cup as the National Stadium is going to be updated, rather rebuilt, in time for those games. The Olympics would utilize the new stadium meaning the costs for the games are theoretically reduced by $1bil. So what does this have to do with Tokyo Sky Tree? From March 4-7, the IOC was in Tokyo to evaluate their bid. Tokyo Sky Tree, and also Tokyo Tower, was specially lit to welcome the IOC Evaluation Commission. Tokyo Tower was lit up and 2020 was placed on the side. 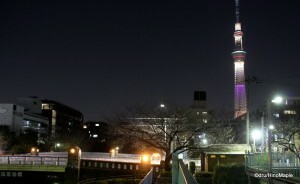 Tokyo Sky Tree utilized its lighting to create the 5 Olympic Rings. The central column had blue, yellow, purple (black), green, and red. The colours would start at the bottom and rise up to the midway point of Sky Tree. Each colour would rotate and if you had no idea what was going on, you wouldn’t be able to understand. Last year they did the same thing when the Olympic Bid was turned in and I had no idea why it was changing colours until I checked the news. Tokyo Sky Tree also had a special race line. Usually the white ring on each observation deck rotates to signify the passage of time. If I remember correctly, the rings were changed to have 3 lights rotating to signify a race. I could be wrong on this but I did see the 3 lights running around Sky Tree. If you missed it, you may have another chance to see it, but I can’t guarantee it. This entry was posted in Japan, Olympics and tagged 2020 Olympics, IOC, japan, Olympic Bid, olympics, Sky Tree, tokyo, Tokyo Olympics, Tokyo Sky Tree by Dru. Bookmark the permalink. I bet she was. I think it has stopped now. It has for the night but I doubt it will be in those colours tomorrow. They can do a lot of things with their light, can’t they? It’s nice you can check the Tree every night. It’ll be fun to hold Olympic games in Tokyo. I’m not against it at all. But do they have to do all these things, like lighting the Tree, holding dinner party at the National Guest House, and so on? It’s a bit silly, I thought. Yes they can. It is nice to check it but it gets “boring” seeing the same 2 designs every second day. Unfortunately, they do have to do things like lighting the tree. It is important to impress the delegation that is evaluating the city. Tokyo needs to show that we “want” the games. Having a dinner party in the National Guest House and so on is a bit much, but it is supposed to be a lot cheaper than before when they would get real gifts, actually bribes. I don’t agree with the costs for “winning” a bid, but that’s how the governments play the game. If we win the games, it will be an amazing party. Vancouver was really amazing in 2010. As far as the Olympic Games are concerned, I think it’s a waste of money to stage it here. Take that budget and spend it in Tohoku instead. If the games do return to Tokyo, that’s it, I’m fleeing to South Africa for the duration. Wait. Reconsider. Airline tickets will be impossibly expensive. OK, I’m fleeing to Niigata. Glad to be of service. I missed the first night as I was having an after work drink with a friend. PS: Glad the crazy weekend is over.